July 30, 2010 - Cobalt Aircraft Industries, French Headquartered aircraft designer of the Co50 and OEM, has decided to create a U.S. corporation for development, certification, and production of its aircraft. The company unveiled its existence for the first time to the public, along with its first prototype of the Co50 high-performance canard pusher aircraft, at EAA AirVenture. The Cobalt Co50 Canard aircraft is powered by a pusher propeller Continental TSIOF-550-D2B twin-turbocharged 350 HP piston engine located at the tail of the aircraft. The company states the aircraft will reach 245 knots at 25,000 feet burning 25 gallons per hour from its 109 gallon fuel tanks. 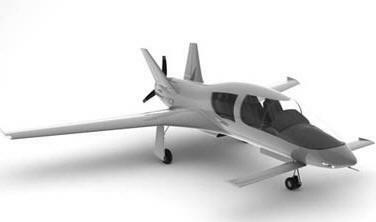 The Cobalt Co50 has a range of 1150 NM, 5 hours at a cruise speed of 202 KTS. The aircraft has an empty weight 1,867 pounds with a useful load of 1,213 pounds. The Cobalt Co50 has a huge wrap around cockpit windshield. The inside is spacious for plenty of room to move around. "We are pleased to announce the creation of our U.S. branch, based in San Francisco, CA. While a final assembly site is still under negotiation, the American activities of the company will be directed from these U.S. Headquarters. We felt that we needed a creative, stimulating environment, and to get closer to our customer base." David Loury, founder and CEO, said. The U.S. branch will be a full duplicate of the French company based in Paris. Its activities will entail engineering, production and assembly, marketing and sales, and customer support for the American markets. Cobalt wishes to tackle its FAR 23 certification program with the FAA before the end of the year, and flight testing is expected to commence at that time. The press conference lasted 30 minutes and included a short presentation of the company, the Co50 prototype, plans for the future for both, and a question and answer session. Hartzell representatives Gary Chafin, Account Manager in OEM sales, and Mike Disbrow, Senior Vice President at Hartzell, joined the Cobalt team for the event. Cobalt Aircraft Industries is an aircraft design company in the process of certifying its Co50 canard turbocharged pusher and is positioned to provide total OEM service from Aircraft On Ground (AOG) assistance to long-term study, manufacture, and certification of customization requests.